July is a bittersweet month for me. It is smack in the beginning of Summer. That’s the sweet part. The bitter part is that it also reminds me the days of Summer are numbered. My novice garden which is thriving by now (despite my black thumb) reminds me how it will barren in just a few months until life comes back again in Spring. I could focus on that, but guess what–I am a realist (which unfortunately is interpreted as being pessimistic). Don’t you agree Spring and Summer deserve more holidays than any other season? Anyway to forget those blues I do what I do best…eat and drink! Today’s emphasis is on the second one. 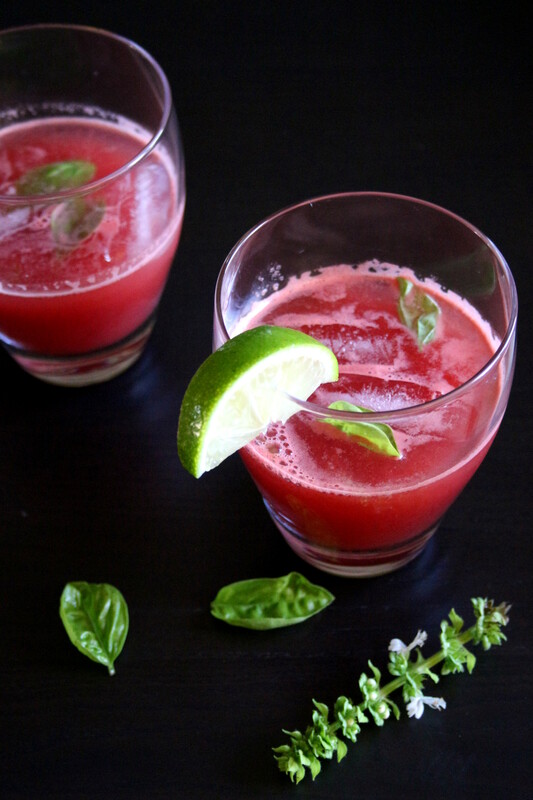 I bet you will agree once you taste these Watermelon Basil martinis! This July we did not travel. After 14 days of traveling in Barcelona, Madrid, London and Paris (with a 5 yr old & 2 yr old–GASP!!!) we were happy to stay put. But we kept having a stream of friends over so there was no shortage of fun and excitement. In those times, Watermelon Basil martinis became a staple. I did not plan on these. It was out of the necessity to make room in the fridge to store some make-ahead dishes I prepared. I had two ginormous chunks of watermelon stealing all the real estate in my fridge. And if not consumed soon, they would be past their prime. So I juiced the watermelon, added some lime juice, blended some basil leaves, sugar and salt to balance the flavors. 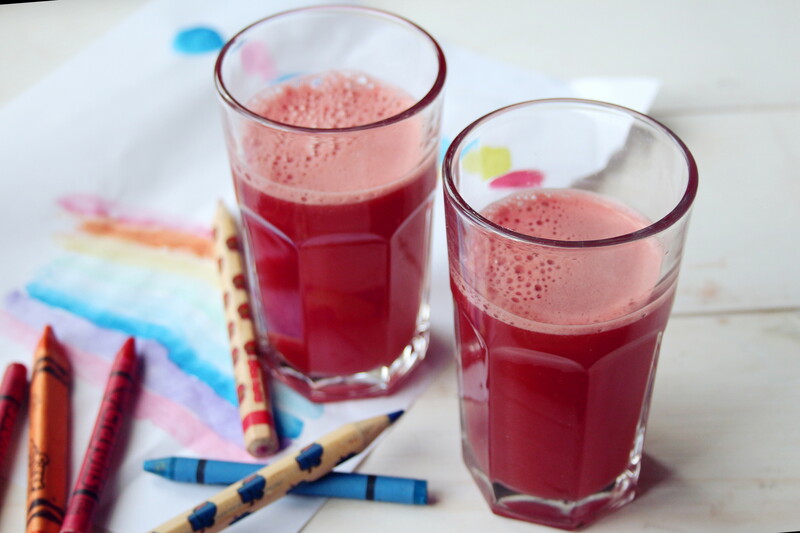 And voila!…painful watermelon turned into a delectable watermelon cooler. Kids drank it straight up. While grown-ups did the grown-up thing…added some booze and called it a martini. All are happy. At least until next holiday hits in September. And Summer is really gone by then. But I will find an appropriate Fall/Winter drink. See I am an optimist! Blend all ingredients until uniformly juiced. Shake them all in a cocktail shaker with ice, and pour into glasses filled with ice. Garnish with a lime wedge and Basil leaf. Sit back and enjoy! !